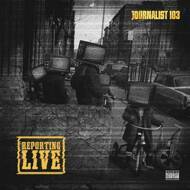 Ever since his rise to underground hip-hop prominence as a member of The Left, Journalist 103 has been regarded as one of Detroit’s most revered lyricists and one of Hip-Hop’s most promising MCs. His work on The Left‘s 2010 critically acclaimed debut album Gas Mask received overwhelming praise from some of the most notable voices in the Hip-Hop. Following the success of Gas Mask, Journalist 103 looks to reach new musical heights as he prepares for the release of his solo debutReporting Live.